Que tal conhecer uma linda vista durante uma pausa para um café? Preparei com carinho um vídeo super legal pra te mostrar um lugar pouco convencional para turistar em Viena. Hoje vamos passear dentro do Justizpalst (Palácio da Justiça) em Viena; a corte suprema na Áustria. O prédio foi construído no estilo neorrenascentista entre 1875 e 1881. O órgão do governo fica próximo ao Parlamento e é aberto ao público. 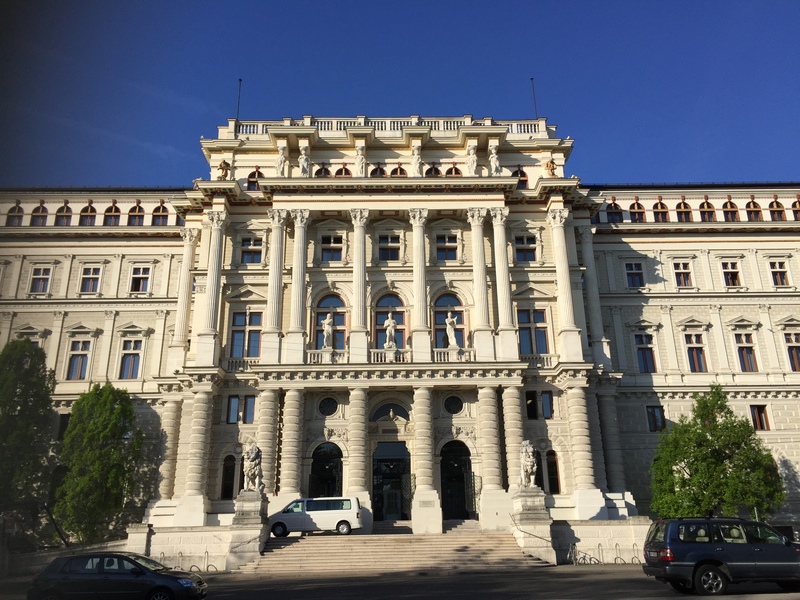 The building was projected by the Historicist architect Alexander Wielemans von Monteforte (1843–1911) as the new residence of the Supreme Court established in the course of the 1848 revolutions and headed by President Anton von Schmerling since 1865. In the Austrian July Revolt of 1927, violent demonstrations took place after a jury had acquitted several nationalist paramilitaries who during an armed conflict with Social Democratic Schutzbund members in Schattendorf had shot a disabled World War I veteran and an eight-year-old child. In the morning of July 15 numerous protesters gathered in front of the Austrian Parliament Building but were pushed towards Schmerlingplatz by the mounted police force. Several demonstrators broke into the ground-floor rooms and began to demolish furniture and files. At about half past twelve, the Palace was set on fire. During their attempts to extinguish the fire the Vienna firefighters were attacked, hoses were cut and hydrantss ran out of water. The fire rapidly spread out all over the building and it took until the early morning to get it under control.